A farewell party was held at the Nishi-waseda International Students' Dormitory. - Waseda University Property Management Corp.
Every year between February and March and August and September is the farewell and welcome season for Nishi-waseda International Students’ Dormitory. On January 27th, a farewell party for international students was held by the RA (Resident Assistants) and other residents of the dormitory. 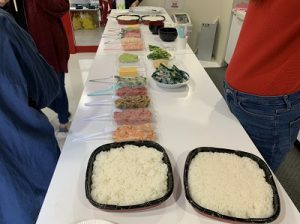 As their last memory of Japan, Scattered Sushi (Chirashi Sushi) was served at the party. 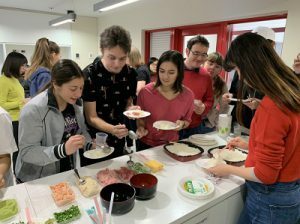 Sushi rice and various ingredients such as vegetables, raw fish, and eggs were placed on the table so that students can create their own Sushi according to their tastes. As they enjoyed their meal it was obvious they were starting to feel reluctant about leaving Japan. In total 59 international students, more than one-third of the dormitory’s capacity (154 people), will be leaving in February after completing their studies at Waseda University. We sincerely hope that these students will be able to use what they have learned in Waseda University in the future and back in their home country.